How can "negative" shapes extend outside of their module? This is a common design problem with the constructive solid geometry paradigm. Let us consider a support for an electronic board. Each of the "pegs" is made of a cylinder, a bevel at the base, and a hollow cylinder for the screw. We conveniently put all these in a "peg" module. Forget about the dimensions, we do not care here. But when we add the blue bottom plate, flush with the pegs, the holes are no more open! Making holes longer will not help, because they apply only to the shapes defined in the one_peg module (i.e. only the cylinders and before the plate is added). A way out could be to take the negative (hollow) cylinder out of the module, and remove them to the union of the pegs and the plate. But it breaks the very idea of a module by sharing "internal" information with the outside (it crosses the module encapsulation). It also makes the source code not very readable and less parametric. Or the module itself could be written with a "positive" and "negative" version like this. The changes are highlighted. plate_th+tol]); // higher to avoid gaps with the pegs! Now there is something annoying: positioning the "positive" peg shapes and the "negative" peg shapes rely on fully duplicated code. This is bad. Indeed, any change in the positioning would need to be duplicated. Bug fixes also! Duplicating code adds uninteresting codelines and it is prone to bugs, because a bug fix may be forgotten as the programmer does not know where and how many times the code was duplicated. It soon becomes very hard to maintain and upgrade such a design! This is why I often use a "placement" module for the location of the pegs. This is a somehow tricky but very powerful Openscad feature. 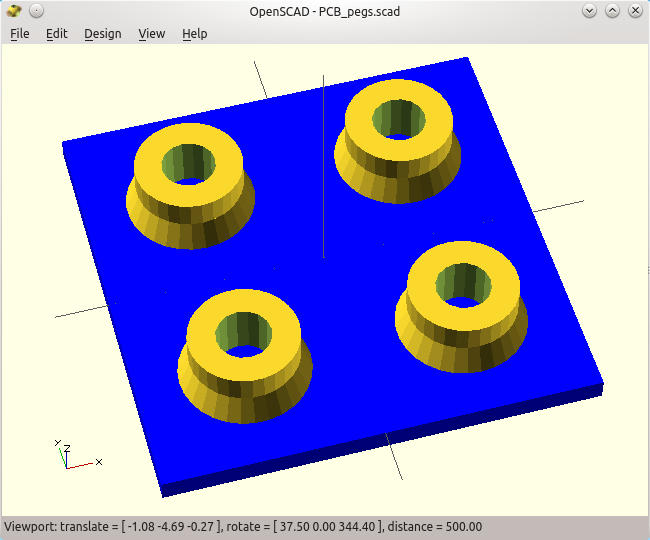 It is not usually found in other languages, which may be the reason why it is too often overlooked by programmers who use openscad. Now, it is extremely powerful as it makes the source code much cleaner, and it allows many optimizations. In practice, when you are in a module, Openscad creates two special variables for you, that refer to the shapes that are in the scope of the module when it gets used. Now, the first children of the module will start at index zero (not one!). So the last children really is children($children-1). Accessing the vector at index $children is an error, just like trying to use a negative number. This is the norm in most of the programming languages when dealing with arrays: the first item is at index zero. So what is a child now? It is any primitive or composed shape that appear right "under" the module call itself. Efficiently translating the "children" of a module proportionally to their order of appearance! Children are really only at the top level withing a module! For the same reason, the iteration below is also one single "unioned" object for the module. It does not see the individual sub-shapes! Hence, the $children feature does not "see" the individual cubes either (they were merged beforehand)! Back to our PCB holder... Thanks to Openscad's $children feature, we now can factorize both the duplication and the placement of each of the four individual pegs. Here again the changes are highlighted when compared to the previous source code. What happens here? The module peg_position() does not create any shape on its own. Instead it does all the work to duplicate and position each of the pegs, and only then it refers to its own children to do something. We have a unique children here each time, a call to the one_peg() module. Here we are. Through-holes for the PCB pegs. children(i); // do the shapes that come after us! The result is a code which is much more readable, and more useful. Still one has to split the added shape and the subtracted shape, and it must be taken into account. The "remove" part must be positioned correctly in the CSG tree, after the plate is merged with the positive peg shapes. Now, whenever other shapes must be positioned relatively to the pegs, we can use the convenient peg("position") module call, and group the shapes in a union that will be "preprocessed" by the module. Another very useful use of children : "Serial hull", aka "chained hull"
Remember the wedge in our previous post? It was built out of "support walls" to intersect a torus and leave only a variable sector. We had to revert to sequence of pairs of convex hulls in order to create the appropriate (concave) final shape. to intersect a torus made from a fully circular rotate_extrude(). The deal here would be to create a module that does the union of a sequence of hulls in a list of children. Let us call this special module "serial_hull( )". ...would create a convex hull of the shapes 1 and 2, then another hull with the shapes 2 and 3, and so. The resulting convex hulls would then be merged (with the default union operation). See how the union of many hulls is definitely not like the hull of all the shapes at once? children(i); // use child() in older versions of Openscad! children(i+1); // this shape is i in the next iteration! Linking a cube, a large sphere, and a smaller one with a union of consecutive convex hulls, the pretty way! Note: if you are using an old version of Openscad you will have to use "child(index)" in place of "children(index)" (they just changed the name of the variable for more consistency). Reciprocally, you can use "child" is a newer version, but you will get a warning stating "DEPRECATED: child() will be removed in future releases. Use children() instead.". So will it help our parametric wedge, to build a partial "rotate extrude"? Remember, we have seen the issue in the introduction to $children above: the module sadly considers the for loop on the wedge_wall() as a single child, and not as separate shapes. chained_hull() // will this create consecutive hulls? NO!! for(r=[0:45:angle-1]) // implicit union of all the items!! rotate([0,0,angle]) // this is only the second child! In fact, and I would like to be corrected, I do not know how we could use $children and "exploded" for loops at the same time. So far, the most compact version I could make is to build the angular sector this way, where some thin walls may be stacked on each other at angle "angle" (no harm with respect to CSG manifold policies). // Revert to angle zero in case the provided one "sub"
wegde_if(45*8); // this last one is "chopped" to "angle"
# wedge(angle=240); // "hash sign" to see it as below! As can be seen, we eventually designed our partial but generic torus! But if/else constructs are usually considered bad practice because they disrupt the CSG tree. Also, because of restrictions in the CSG algorithms, they cannot apply only to the choice of the operation (intersection versus difference), so as to keep a common "content". This is why I tend to favor the former use of valued conditionals like (test ? then_value : else_value) where only values are changed and not the operations. There is a second reason in my opinion: it tends to be faster when rendering the design (probably because cache and optimization are more efficient on a static CSG tree). Anyhow, here is the variant with only convex wedges, which is nonetheless more parametric (there are no more "hand placed" thin walls at each 45°). 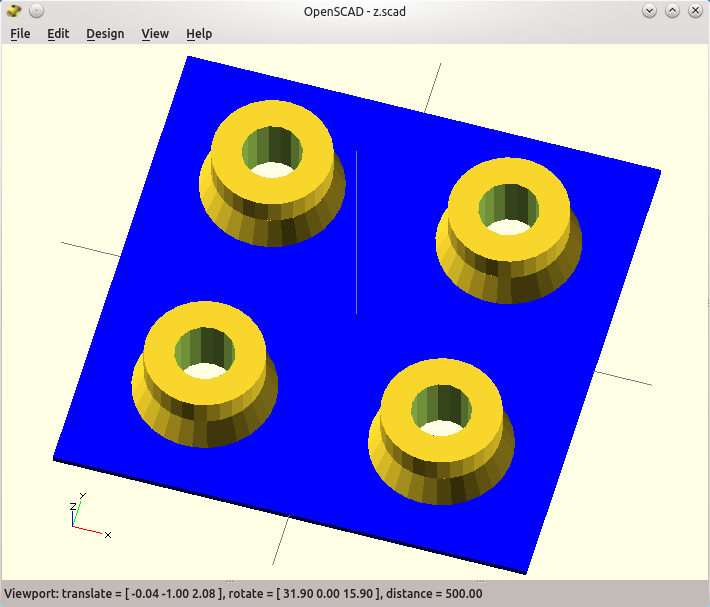 I wrote this introduction to Openscad to help people try and learn it in the first place, and from scratch. The order I presented the features may work as a step-by-step tutorial but they are probably very bad as a reference guide. Google may help bring back some parts, but once here I suggest that the best place to move forward is the official and comprehensive documentation. or just the short list of all the functions and features of the language. Update: see last paragraph for links. As we have just seen, keep in mind that there are always many different ways to design one object. But make sure you think about re-usability, parametric designs, and that you avoid pitfalls in the very first place. Because of lack of policies, there are just too many Openscad designs that are completely unusable... including some of my early ones, that I learnt the hard way. Parametric designs are a huge winner for 3D printers, because they let you tweak the tolerances easily with the reality of the first prototype. You need 0.2 mm more clearance? Openscad computes it all over again and you can print it again, it is amazingly efficient. 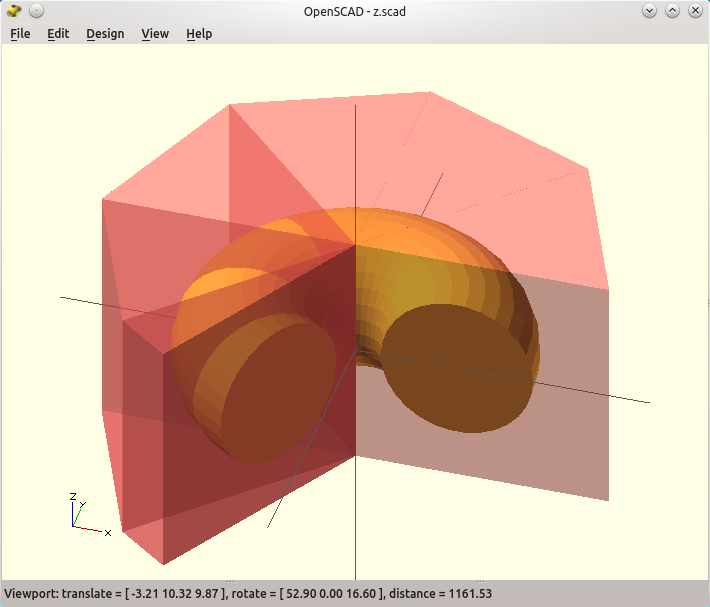 Yes, Openscad is a very powerful tool to design 3D shapes. 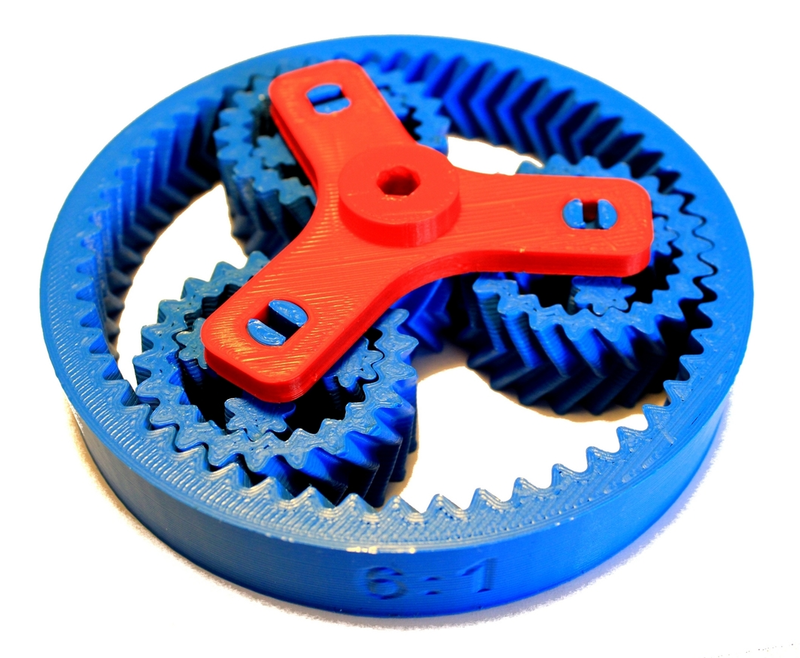 It is not interactive, but it is nonetheless one of the very best, free and ubiquitous tools to design semi-industrial parts, like 3D printer links. It is not well suited to artists because it lacks fundamental primitives likes bezier curves or splines (well, almost since they can be coded separately), and no mouse will help you in the design process beyond rotating the part and zooming on it, and contrary to most of the heavy-loaded and often expensive CAD software. But this is why Openscad is a powerful tool also in my opinion: I do not have to learn and keep practicing hundreds of shortcuts in Blender to be able to design whatever I need. I mostly never had something I could not make with openscad, and this is also why I keep on falling back to it, even when I wish it had a few more features like bevels, local variables or "professional" output formats and dimensions. More features? Here is an example to make an ellipse() out of a function and thanks to polygon(). The deal is to generate the pairs of [x,y] points oursleves, which opens many possibilities.